Capture and analyze HTTP traffic and rebuild the HTTP files. Capture usernames and passwords sent through http, ftp, smtp, pop3, telnet. Simple MSN chat monitor solution for your network. Monitor MSN messenger conversations on LAN. Monitor AIM conversations on LAN. Monitor ICQ conversations on LAN. Browse and print RFC with ease. Input your email to get news monthly. EffeTech develops a series of award-winning network diagnosis and Internet administration software for parents, network administrators, and network protocol developers. These groundbreaking sniffer software helps you accelerate your development, identify Internet abuse in your LAN, and discover further information beyond common packet sniffer. Simple MSN chat monitoring solution for your network. MSN Sniffer 2 is world's first sniffer to automate MSN chat capturing and impact analysis. 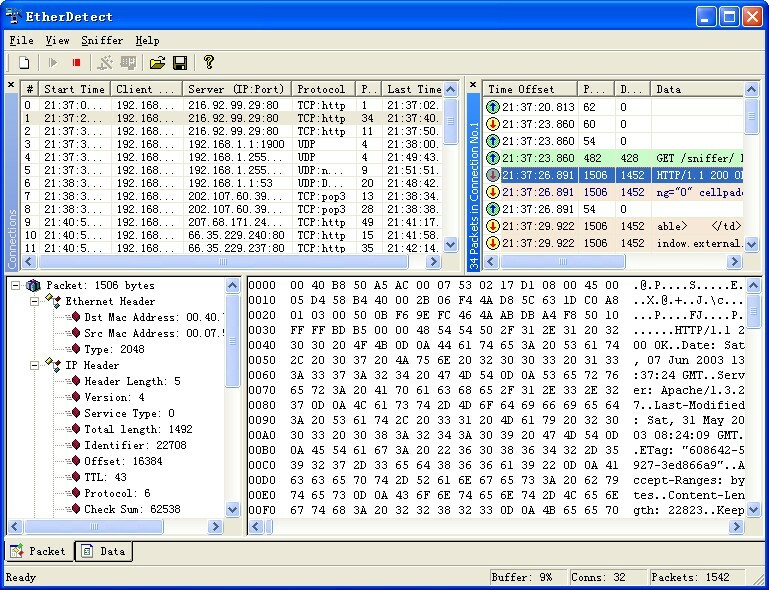 After installed on one computer, it captures MSN chat across all computers in the same LAN, analyze and save into database for future analysis. Recover passwords through http, ftp, smtp, pop3 and telnet. New version provides candidates of username or password for HTTP post submission. The effective password recovery utility brings you a brand-new way to get your forgotten password back. Network administrators or concerned parents can also use it to capture passwords of other users, but such action may be considered as invasion of privacy, and make sure you have the right to do so. 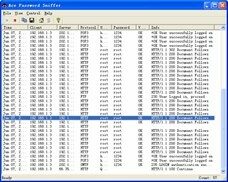 Currently Ace Password Sniffer supports passwords monitoring through FTP, POP3, HTTP, SMTP, Telnet, including some web mail password. Connection-Oriented Packet Sniffer and Protocol Analyzer. EtherDetect Packet Sniffer enables you capture full TCP/IP packets and organize them by TCP connections or UDP threads. With its powerful filter, you can customize what you need to capture and avoid those irrelevant packets from disturbing you. It is also easy to detect what are transferred out from your computer. EtherDetect Packet Sniffer is a helpful tool for network developer, web page designers, LAN administrators, security professionals, C++/Java/ASP/JSP/PHP/SOAP programmers, and those who are interested in network traffic going through his PC or the whole LAN. The new version supports live capturing for Intel wireless network adapter, Vista x86, and Vista x64. Who have surfed where online? 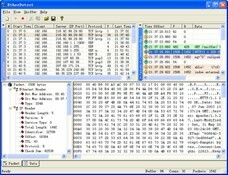 EffeTech HTTP Sniffer is a HTTP protocol packet sniffer, network analyzer and file reassembly software based on Windows platform. Unlike most other sniffers, it is dedicated to capture IP packets containing HTTP protocol and to reassemble the HTTP communications and files sent through HTTP protocol. Its smart real-time analyzer enables on-the-fly content viewing while monitoring and analyzing. It can also parse and decode HTTP protocol, and generate a web traffic report for reference. By delivering an ideal mix of power, ease of use, and functionality, the award-winning EffeTech HTTP Sniffer has become the preferred choice of managers, network administrators and developers worldwide. No matter you are a professional or a rookie, you can easily get HTTP web traffic report on your network. New version supports chunked or gzip mode. TRADEMARKS: Windows, MSN and MSN Messenger are registered trademarks of Microsoft Corporation. AIM and AOL are registered trademarks of AOL. Sniffer is registered trademarks of Network Associations. Any other trademarks are property of their owners. This site is not affiliated in any way with Microsoft Corporation, AOL or NA. YouTube Robot download YouTube Video for iPhone, PSP..
rankradar search ranking monitor service launched. Update Password Sniffer and AIM Sniffer. HTTP Sniffer version 4.1 released. MSN Sniffer version 2.1 released. EtherDetect Packet Sniffer version 1.4 released.
" I'm maintaining a web site. With EffeTech HTTP Sniffer, I can exactly know who has visited my specific pages. " " Your HTTP Sniffer is a great debug tool to help us develop http programs. It accelerates our developing speed substantially. " Copyright © 2009 EffeTech. All Rights Reserved.